It’s one of the biggest news stories in the resource market right now. And it’s an example of the massive destruction of value that can happen in this sector. In 1974, Glencore was founded as a metals trading house in London. When it went public in 2011, it said it marketed 60% of the world’s zinc output, 50% of its copper, and 45% of its lead. But Glencore’s loud, gunslinging CEO, Ivan Glasenberg, had bigger plans. Shortly after the 2011 peak of the resource bull market, Glencore raised more debt to invest in commodities. For example, in February 2012, Glencore announced it was merging with miner Xstrata (the primary products of which were coal, copper, and zinc) to become one of the world’s largest metals producers. Glencore spent more than $40 billion on the purchase. But then commodities prices declined. The prices of coal and copper are down 28% and 26%, respectively, since the deal closed in May 2013. Zinc has stayed nearly flat over this period. And now, Glasenberg is trying to stave off bankruptcy. Thanks to all of its commodities investments, Glencore has $50 billion of debt, while its current market cap is $17 billion. Its debt is already more than five times its earnings before interest, taxes, depreciation, and amortization (EBITDA), so raising more debt isn’t an option. To pay back this debt, the company is in the process of selling several assets – like its Australian and Chilean copper mines – for much less than it paid to acquire them. So far, it has sold $2.5 billion of equity for a fraction of what it could have received just a few months ago. Glencore is cutting capital expenditures and costs. The company is also looking for “streaming” deals in which it exchanges future delivery of precious metals for an up-front lump-sum payment from streaming (also known as royalty) companies. In September, Glencore even announced it was scrapping its dividend. South African investment bank Investec noted that Glencore could see all of its equity become worthless if commodities prices stay weak. As a result of its struggles, Glencore shares were cut in half twice from their year-to-date high at the end of April. Overall, since closing at 314.9 pence (equal to $4.83) on April 28, they’re down more than 60%. To be clear, Glencore still has one big positive that smaller commodities companies don’t: it owns a lot of assets. Glencore can generate a lot of cash by selling assets. This will help ensure it has enough cash to survive – for now. But it’s selling at the bottom of the market. This doesn’t create long-term value… it locks in losses. And selling assets hasn’t been enough for Glencore to prop up its share price. Glencore isn’t the only resource company in this situation today… As I showed you last week, Big Oil companies like ExxonMobil, Royal Dutch Shell, Chevron, and BP are all struggling to produce oil at a profit, reward shareholders, and pay back their massive debts. These names are all down around 20% since oil peaked in June 2014. And like Glencore, they could fall much further. Glencore should have stayed a trading company using other people’s money. Like Mitsui has done for hundreds of years. Once they invested vertically into the product they traded they started eating their own sandwich they had for sale. As a resource investor (today) I’m holding low debt (thanks Wolf – I followed your caution on this), Ozzie gold producers who are all up over 30%, some near a double-bagger. There’s no problems selling gold to the market and despite the wailing of gold bugs who bought at the peak it’s still not cheap. ASX:SBM, RSG, DRM, RMS, NST, RRL. hidflect, I agree completely, I am also doing very well on zero debt, highly profitable Aussie mid cap Gold miners. I particularly like NST followed by RRL due to what appears to be excellent management, although RRL do hold a small amount of debt. 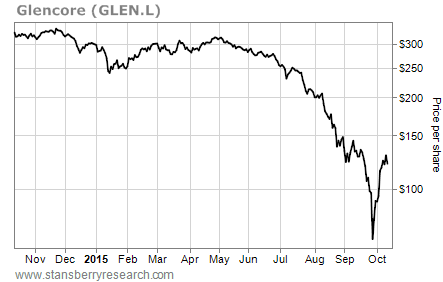 I believe people are kidding themselves about Glencore it will go to zero. On the London stock market, i reckoned GLEN was cheap at £1.26 so i bought and the following week after the results sold at £1.35 i reckoned the share price woukd rise that week as buyers got in before the stock went x-div but also surely that buyers would’t be so short-sighted as to get locked in at a higher price just to get the last divi for the foreseeable future. I was right and wrong. The so hit £1.41? before xd then went tumbling down. Had I had the same wits about me i would have rebought at £0.76 – the price hit £0.67 – and doubled my money on the upturn. But unlike the market, I thought GLEN was going for broke. ps – it is suggested that the only reason GLEN’s stock price has risen from its low point is that commodity anakysts are talking up the market so as to enable investors to profit on the upturn before bailing out altogether. I considered buying into GLEN at the ipo but recknined the company was full if hot air. GLEN has done well for its directors and the more canny shareholders but the future isn’t so stable. Selling assets at rock bottom prices to buyers who will only pay distressed prices is not debt-management, but debt fear. Thanks for bringing that up: that thing looked a bit too suspicious to be your run of the mill dead cat bounce. I find myself wondering more and more as to how commodity companies such as Glencore, Rio Tinto, Exxon etc are able to keep up their share values at a level I find completely unconnected to the underlying fundamentals, which look pretty bleak right now. China is not going to pull out of that slump anytime soon and if Japan’s and Germany’s factory orders are anything to go by there’s even more to worry about. Your idea that analysts are “talking up the market” makes a whole lot of sense, though I may disagree on their motivations. Exxon at $80 (and rising) right now is far more than I would pay for it (in the $68-70 ballpark), especially considering all the frankly moving attempts we had in the past year to pump the price of oil have ended in farce (or tragedy, if you are an overleveraged shale company or the Venezuelan government). Glencore at £125 (and rising) right now makes even less sense, especially considering how leveraged the company is and that at the moment more than a commodity producer is putting its assets on the market to raise hard cash, even at depressed prices. The difference is that Exxon will survive in its present form. Glencore won’t, unless China manages to pull even more phony growth out of her hat. But with worldwide trade slumping and every export-driven economy in the world eyeing the exhausted and leveraged to the brim US consumer with greedy eyes I am not so sure they can pull it off this time. Thanks for the information ML, I was a bit flippant with my earlier comment on Glencore. Very good article Matt. Here in Canada, Barrick Gold Corp. has been beaten down over the last couple or more years for that very reason–high debt and weakened gold prices. Of course, the bosses that created this mess and rewarded themselves handsomely are gone mostly. I avoided this clunker of a stock following the “trend-is-your-friend” principle. When their debt started to escalate, the commodity prices started to weaken, selling volume increased, etc., that was it for me, the unsophisticated rube. Resources have been getting hammered for at least a year now. I wonder what the cycle is for them? What are your thoughts about Newmont Mining? Debtload is significant, but cashflows are good and management seems to be ok.. Pretty sad when the ‘one big positive’ is the ability to sell the silverware at the bottom of the market.